** I received a copy of this book for review, all thoughts are 100% my own. I love marriage. There is nothing greater than the idea of spending the rest of your life with the one you love, is there? I'm sure when most of us get married, that is exactly what we intend... to grow old together. To go through life, side by side, forever and always, living happily ever after. On that big day, we don't want to think about the hard times, we don't want to think that it might not last. But did you know that 40-50% of first marriages in the United States end in divorce? That's a pretty scary statistic. As I said, when we are planning our weddings and just beginning to start these brand new lives together, we can never imagine that we might be in that 40-50% percent. We believe that that cannot be us, because we have great relationships. We don't always acknowledge that it won't always be that easy. All too often we see the couples that we thought would beat the odds- the perfect couples- calling it quits. Perhaps you see this happening around you, and you find yourself wondering- if they cannot make it work- the perfect couple that they were- how do any of us stand the chance? I certainly have wondered this myself. My husband and I have been married for 8.5 years. In those 8.5 years, we have been through many hard times in our personal lives. We have faced deployments, raising a special needs child, moves, finanacial ups and downs and so much more. We have faced many obstacles that would send many couples to their breaking points. Around us, we have seen many marriages come and go, for much less. All of us want an enduring marriage, a beautiful marriage we can believe in. That kind of marriage happens through intimacy. Intimacy requires hard work and a guide. 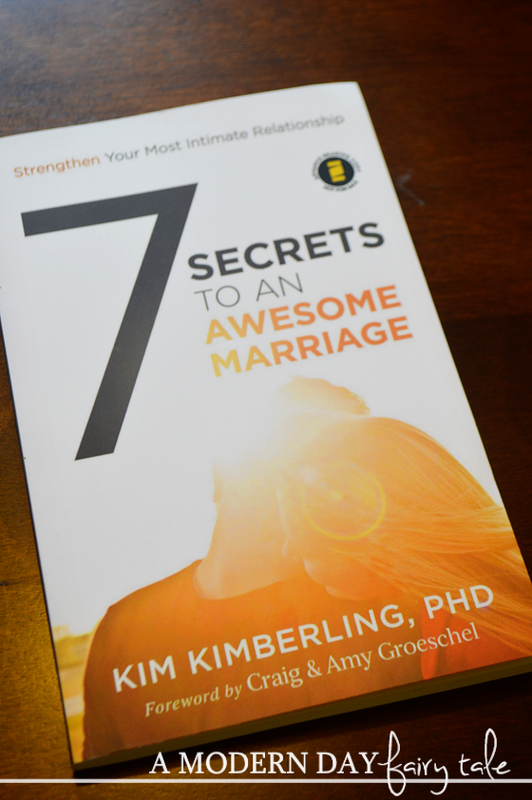 Dr. Kim Kimberling is that guide, and this book and its tools will show you how communication and intimacy in marriage can be yours. Do you ever read a book on marriage and feel like it's just kind of preaching at you? Like it seems to be (intentional or not) written by someone who is perfect? Not human like yourself? 7 Secrets to an Awesome Marriage is not one of these books. While it does encourage us to take a look at how we communicate and interact with our spouse, it doesn't make us feel like a failure when we are less than perfect. In fact, Kim himself shares instances where he and his wife had those moments as well. Now, knowing the counselor who has counseled hundreds of couples throughout the year doesn't always get it right either, makes you feel a whole lot better about your own shortcomings right? And it makes it a lot more relate-able too. For the most part, these secrets are nothing new... you might even read a few of the 'secrets' and think 'duh, isn't that obvious? ', but obvious as they may be- we still find ourselves not always following them. This book offers practical advice that is both wise and relate-able. It takes those secrets that we all kinda know, and truly makes them much easier to understand and apply to our own lives. But perhaps my favorite part of this particular book, was that it reminds us that a marriage is NOT just two people. No, in order to have a successful marriage, we must be sure to include God as well. It is with His help that we can strengthen our marriages and live out those happily ever afters. No matter how long you have been married, or where you are in your marriage, this is truly a great read! 7 Secrets to an Awesome Marriage comes out on July 28th, but you can preorder now at Family Christian. I love the pewter rose bracelet from Family Christian!! I also love their home decor!! I've got my eye on some of their kitchen items. I would love "Snuggle Time Devotions That End With a Hug". I have another book in that series and my toddler loves it! Whatever you can pay down on the credit is the best wagered to work out of a broadened title advance effortlessly.